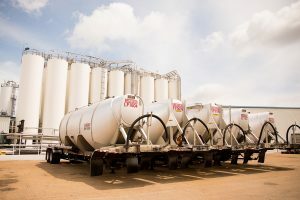 Whether picking up raw feedstock or delivering finished product, KW is highly regarded for its rapid response, reliability and on-time delivery. Transportation is provided by Wiley Sanders Truck Lines, which operates over 3,000 pieces of equipment in 48 states and Canada and a modern 100,000 sq ft repair and maintenance center. 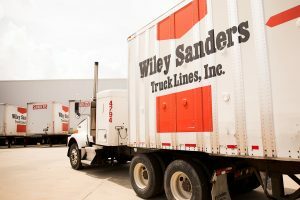 Wiley Sanders Truck Lines is uniquely experienced and equipped to provide dedicated bulk pneumatic services. Each of our tankers are dedicated to our resin products to eliminate the possibility of contamination. Satellite tracking is utilized to transmit the exact location of pickups and deliveries anytime day or night. KW Plastics also owns our own rail facility in order to store and ship bulk rail loads. CSX is our rail carrier. Effective October 1, 2013: KW Plastics is pleased to ship our customers’ HDPE and PP post-consumer resins in hopper cars (HC’s) as appropriate. To this end, the HC is to be respected as KW property and to be used safely and in accordance with all generally accepted best practices and applicable regulations and laws. KW Plastics extends free demurrage for 30 days on all HC’s after they are constructively placed on the customer’s siding. Beginning with the 31st day, demurrage will be charged at the rate of $100 per day. Scales are conveniently located onsite. ALL DELIVERING CARRIERS MUST HAVE A DOCK APPOINTMENT. In order to receive a dock appointment, you must have your Purchase Order Number and Container Number available for KWR personnel. Dock Appointments can be made by contacting Scalemaster Gary Callin at (334) 566-1563 ext 418. Take HWY 231 South 46 miles to Troy, Al. Continue on 231, turning right at the second intersection onto County Road 2290. Go ½ mile and turn left as you cross the railroad tracks onto Pike County Lake Road. Go ½ mile; KWR is on the right. Take HWY 231 North 51 miles to Troy, Al. Continue on 231, turning left at the fifth intersection onto County Road 2290. Tome la autopista Highway 231 Sur 46 millas a Troy, Alabama. Continue por la Highway 231 hasta llegar a Troy, y tome la segunda luz de freno (o interseccion). Doble a la derecha en County Road 2290. Vaya media milla y doble a la izquierda al cruzar las vías del ferrocarril y la carretera es Pike County Lake Road. Vaya media milla. KWR esta a la derecha. Tome la autopista Highway 231 norte 51 millas a Troy, Alabama. Continúe por la Highway 231 y doble a la izquierda en la quinta intersección (despues que uno entra la ciudad deTroy) en County Road 2290. Vaya media milla y doble a la izquierda al cruzar las vías del ferrocarril y la carretera es Pike County Lake Road. Vaya media milla, KWR esta a la derecha. TODOS LOS OPERADORES DEBEN CONTAR CON UN BASE CITA. Con el fin de recibir una base cita, usted debe tener su numero de orden de compra y numero de contenedor para KWR personal. Las escalas son in situ. Se pueden hacer citas de base en contacto con Gary Callin, telefono 334/566-156, ext 418.